This table shows the calculation of the UEFA team coefficients, which are determined by the number of points added to 20% of the country coefficient. The basis for the UEFA coefficients is the performance of teams in the European Cups during a five year period. During that period each team gets two points for a win and one point for a draw. In addition one bonus point is allocated for reaching the quarter final, the semi final and the final. Qualification for the group-stage of the Champions League is awarded with 4 bonus points. Qualification for the first knock-out round of the Champions League yields 5 bonus points. The UEFA team ranking is computed by the sum of 5 coefficients in the last 5 years. para quem precisar e não souber. Exactamente. 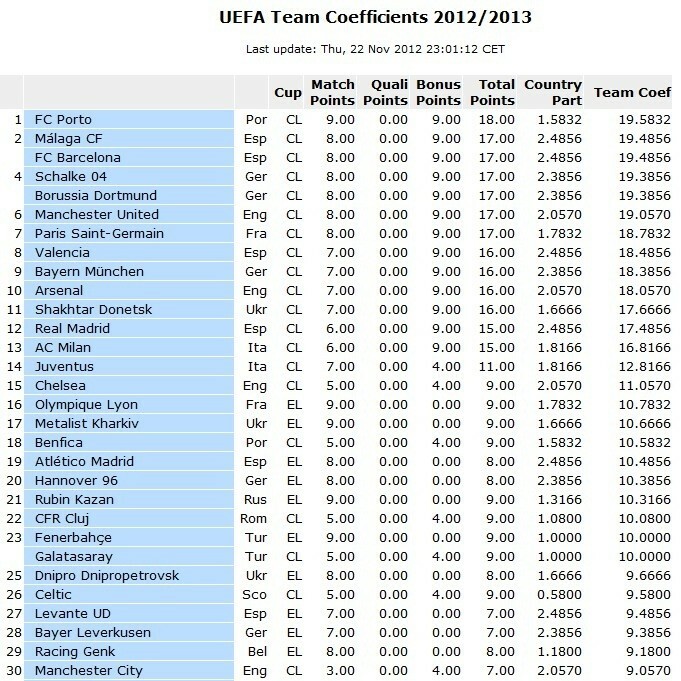 Aliás, o título - UEFA Team Coefficients 2012-13 - é claro.